The Zero Waste Monster is a self-contained, hopper-fed liquid depackaging system designed to separate liquids, gels, creams and semi-solids from their plastic, glass or metal containers. It can be used as a depackaging system and also as a food recycling machine. The industrial shredder and separator turns large quantities of waste into a clean and compacted recyclable commodity. This patented system will give you the peace of mind associated with onsite product destruction and product depackaging, while saving you money in waste hauling and landfill fees. Food waste from the system can be used for composting or turned into biogas. The clean, compacted solids from this food recycling machine can now be easily recycled! The Zero Waste Monster liquid depackaging system utilizes a 6-step process for product destruction and material recycling. 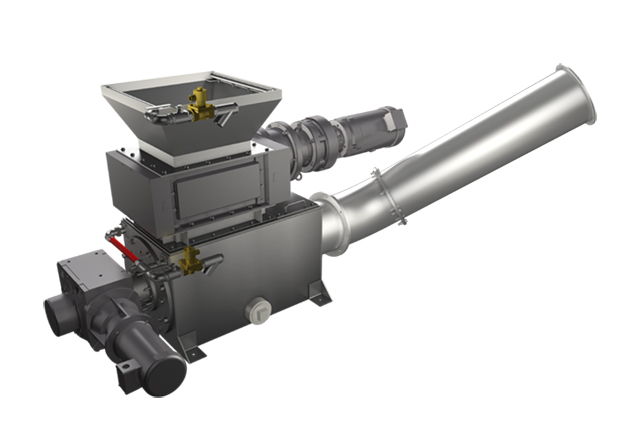 The hopper fed system will utilize a Monster Industrial shredder to break open packaged wet food, fluids and creams to separate out the liquid contents from the packaging. The packaging materials will be washed and compacted in an auger system then discharged from the Zero Waste Monster. The cleaned metal or plastic is ready for recycling while the liquid waste is washed out and captured so it can be sent to a bio-digester or be used for composting. Product Depackaging System - the Zero Waste Monster - Make Recycling Off Spec Product Waste Simple! The Zero Waste Monster (ZWM), a product depackaging system, is a self-contained depackaging system designed to separate liquids, gels, creams and semi-solids from their plastic, glass or metal containers. This rugged shredder and separator chews through large quantities of waste, off-spec or expired packaged goods and leaves you with clean and compacted recyclable material. Helps reduce the amount of food waste sent to landfills. Need a Product Destruction System?